Israeli President Shimon Peres says this is an "opportunity to make peace"
JERUSALEM (CNN) -- Israeli President Shimon Peres on Tuesday stressed the need for a two-state solution in the quest for Israeli-Palestinian peace, a position out of step with the current Israeli government. 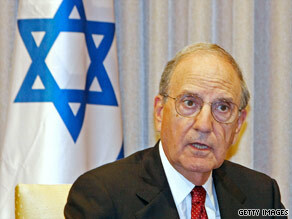 U.S. envoy George Mitchell says Israel and the United States will remain close allies. It was one of several key issues both sides must emphasize if they are to take advantage of the current "historic period" and achieve peace, Peres told visiting U.S. envoy George Mitchell. "Nobody knows whether it will recur and nobody will forgive himself if we miss the opportunity to make peace," Peres said, according to a release from his office. In their meeting, Mitchell said U.S. President Barack Obama is seeking a prompt resumption of the stalled Mideast peace talks and played down tensions that have arisen between the U.S. and Israel in recent days -- particularly over Israel's recent settlement expansion. "Israelis and Palestinians have a responsibility to meet their obligations under the road map," Mitchell said. "And we all share an obligation to create the conditions for the prompt resumption and early conclusion of negotiations." The 2003 road map is a peace plan that calls for an independent Palestinian state with a secure border with Israel, and the implementation of a comprehensive peace agreement between Israel and its Arab neighbors. Israeli Prime Minister Benjamin Netanyahu, who took office in March, has stated his opposition to an independent Palestinian state, and his opposition has cast doubt on the future of the stalled Israel-Palestinian peace process. Peres was elected president during the term of Netanyahu's predecessor, Prime Minister Ehud Olmert, who supported a two-state solution to achieve peace. Peres won the 1994 Nobel Peace Prize for his efforts as foreign minister to secure peace, along with Israeli President Yitzak Rabin and Palestinian leader Yasser Arafat. But in his discussions with Mitchell, the 85-year-old president stood firm on Israel's current settlement policy, despite the road map's provision for Israel to halt building settlements in occupied territories. "There is agreement in Israel regarding the evacuation of illegal outposts and not to build new settlements," Peres told Mitchell. "However, the issue of natural growth in the settlement blocs must continue to be discussed intensively in order to reach agreement." In recent days, the Obama administration has repeatedly called on Israel to stop construction of settlements. In a speech to the Muslim world Thursday in Egypt, Obama said his country "does not accept the legitimacy of continued Israeli settlements." So far, Netanyahu has refused U.S. calls to stop them, and said he will deliver a major speech Sunday in which he will lay out his plan for the country's peace and security. "Let me be clear. These are not disagreements among adversaries," said Mitchell, who was dispatched to the region to try and kick-start the negotiating process. "The United States and Israel are and will remain close allies and friends." Peres, too, tried to calm the diplomatic waters. He told Mitchell that the Obama administration's focus on "a single issue ill-serves the wider diplomatic process which is supposed to set the agenda for Israel and its neighbors." Mitchell also met Tuesday with Israel's Defense Minister Ehud Barak, and is expected to meet with Netanyahu, Israeli Foreign Minister Avigdor Lieberman, and Palestinian President Mahmoud Abbas. Meanwhile, the State Department announced that Mitchell will spend two days in Syria this weekend as part of the Obama administration's vision for comprehensive peace in the region. Before heading to Damascus, Mitchell plans to visit Ramallah, the seat of the Palestinian Authority, and Lebanon, State Department spokesman Ian Kelly told reporters in Washington. "This is a very high priority," Kelly said. U.S.-Syrian ties have been strained in recent years over the Israeli-Palestinian conflict, the war in Iraq and the ongoing political struggle between pro- and anti-Syrian factions in Lebanon. The United States has not had an ambassador in Damascus since 2005.